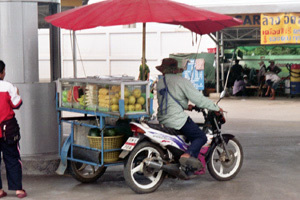 When a financial crisis hit Thailand’s economy in 1997 and wages dropped, the share of households in business for themselves nearly doubled to 40 percent, including those who started small businesses selling fruit. University scholars will team up with researchers at the Massachusetts Institute of Technology’s Poverty Action Lab and Yale University’s Economic Growth Center to focus on wealth creation and poverty reduction in developing countries. Funded by a $3.3 million grant from the John Templeton Foundation, the project will bring together some of the nation’s leading economists and scholars to form The Enterprise Initiative, based in the Department of Economics. Members of The Enterprise Initiative will assemble data and develop high-quality models that will focus on the role of enterprise and simulate the impact of various alternative polices, said project director Robert Townsend, the Charles E. Merriam Professor of Economics and the College. With the help of researchers at the University’s Computation Institute, The Enterprise Initiative will integrate advanced computation and seek to develop an innovative and complex Web-based program that will provide visual simulations of different policies. The new models will evaluate the choices of occupation, education and access to credit and insurance at the household levels, as well as simulate the impact on growth, inequality and poverty reduction at the regional and national levels. Townsend’s work in Thailand, in which he examined individual decisions in the home and determined the relationship of those choices to economic changes on a national level, spurred The Enterprise Initiative. Thailand is a prototypical developing Asian economy with a strong culture and history of entrepreneurial activity. Townsend’s research integrates survey and geographic data from government ministries with his own longitudinal survey data. The Townsend Thai data comes from the Thai Family Research Project, which Townsend helped establish and has co-directed for more than 10 years. That project is an ongoing longitudinal study of nearly 3,000 households in Thailand. Poverty has decreased by more than 60 percent in the past 35 years, with dramatic regional patterns of growth, first concentrating around urban centers and later in more remote areas. However, inequality persists. Households have made persistent transitions from rice farming to other occupations, including business. Since profits from business are high, relative to wage labor, and early on there were few households in business, this transition is associated with an increase in per-capita income and growth in inequality. However, this income differential has decreased as demand from industrialization eventually increased the wages of unskilled labor. Occupation shifts, education and enhanced intermediation account for 39 percent of income and inequality changes. Approximately 80 percent of the growth in productivity at the national level is due to entrepreneurial activity, along with an expanding formal financial sector. After Thailand faced an economic crisis in 1997 and wages dropped, the share of households in business for themselves nearly doubled to 40 percent, though these businesses were not as profitable as those established before 1997. The availability of credit from government loan programs and community-based cooperative loan arrangements has had a notable impact on consumption, profits and wages. Building on Townsend’s research, The Enterprise Initiative will use the precise data from Thailand to construct the monthly income, balance sheets and cash flow statements of scientifically sampled households to evaluate the effects of entrepreneurship on macro-economic growth. Additionally, the initiative will seek to collect new data from other emerging economies, such as Ghana, Mexico and India, to test economic theories and evaluate enterprise on a wider scale. As they incorporate their own expertise to evaluate the range of choices and consequences that arise as an economy grows or fails to grow, The Enterprise Initiative members will tackle questions developed by economists. The data will assist policy-makers in modeling different policy options, and the researchers will be able to suggest, for instance, how constructing a road in a particular area could boost business and what financial products and services could be most effective in encouraging development. The initiative members also will shed new light on the circumstances that led to the growth of entrepreneurialism, a critical asset in emerging economies. The researchers intend to examine how people in ordinary circumstances become involved in the creation of wealth for their own benefit and ultimately the benefit of many others. It will examine factors such as mindsets, aspirations and talent, which enable people to overcome obstacles and become accomplished entrepreneurs. By gathering data, sharing the stories of successful individuals who have made transformations from poverty to relative abundance, modeling choices and modeling their impact on the larger economy, The Enterprise Initiative participants hope to provide guidance to policy-makers and others who are looking to alleviate world poverty.